The Finnish tradition has inspired more than 30 countries to adopt a similar program. For over 75 years, Finland’s baby boxes have helped the country achieve one of the lowest infant mortality rates in the world. In 2016, the tradition is coming to Canada. 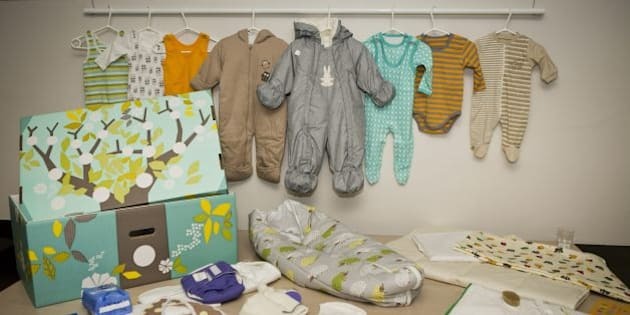 The maternity box is essentially a care package given to every new mother in Finland. The cardboard box contains all the supplies a new parent would need, including clothes, diapers and toys. The box itself even comes complete with a built-in mattress, so that it can be used as the baby’s first bed. The tradition began in 1938 as a way to give all Finnish babies an equal start in life. The baby boxes were given by the government to low-income families and new mothers had to visit their doctor before the fourth month of pregnancy in order to receive one. Since the program began, Finland’s infant mortality rate has significantly decreased from 10 per cent of babies dying before the age of one to just 0.3 per cent. As a result, Finland has inspired more than 30 countries to adopt a similar program, including Canada. Now, with the support of grants, a new program called “Welcome to Parenthood” will be distributing 1,500 baby boxes to Canadian parents starting January 2016. The initiative came about after Jennifer Clary, co-founder of The Baby Box Co., the first company to make baby boxes outside of Europe, teamed up with the Alberta Government and University of Calgary. While the company commercially sells different versions of the baby box, they also work with governments and non-profit organizations to customize packages for different communities. “We’re using the basic baby box, with the mattress, and we’ve collaborated with the province on some basic additions,” says Jennifer Weber, Government of Alberta’s senior manager of Early Childhood Development Services. Besides the mattress, Canada’s baby boxes will include onesies, breast pads and plush toys. Additionally, in their package, new parents will also receive an online video program of experts answering baby questions. According to data from World Bank, Canada’s infant mortality rate is quite low at 4 deaths per thousand births. Despite this, Weber says the maternity boxes are still needed in the country. According to Weber, Canada’s maternity box is currently still in the testing stage and will only be available in Alberta in 2016. The hope is to have widespread distribution as soon as possible, but that is likely a long way off.